On January 23, John Kiriakou, the CIA’s former director of counterterrorism operations in Pakistan, was arraigned in federal court and charged with espionage, disclosing the identity of a covert operative, and lying to investigators. The charges stem from a conversation he allegedly had about waterboarding with a New York Times reporter, and he faces 30 years in prison for all of the allegations. His wife Heather, a top analyst with the spy agency, resigned several days after her husband was indicted. The record number of espionage charges appear to be intended to intimidate journalists and would-be whistle-blowers from discussing any of the U.S. government’s illegal or unscrupulous activities. While improper disclosure of classified information such as Kiriakou’s can possibly be harmful to U.S. National Security, there is a palpable difference between charging a person with illegally revealing classified documents, and espionage – betraying American secrets to a rival nation. Charging someone under the World War I-era Espionage Act conjure images of Julius and Ethel Rosenberg, the American Communists executed in 1953 for passing nuclear secrets to the Soviet Union, or, more recently, CIA double-agent Aldrich Ames – who betrayed at least nine clandestine agents to the USSR and Russia. Aldrich Ames was charged under the Espionage Act in 1994 of leaking classified CIA documents to the Soviet Union and Russia, and pleaded guilty to selling classified national security information to the KGB in exchange for almost 5 million dollars. He is currently serving a life-sentence as federal prisoner # 40087-083 at a high-security federal penitentiary in Pennsylvania. 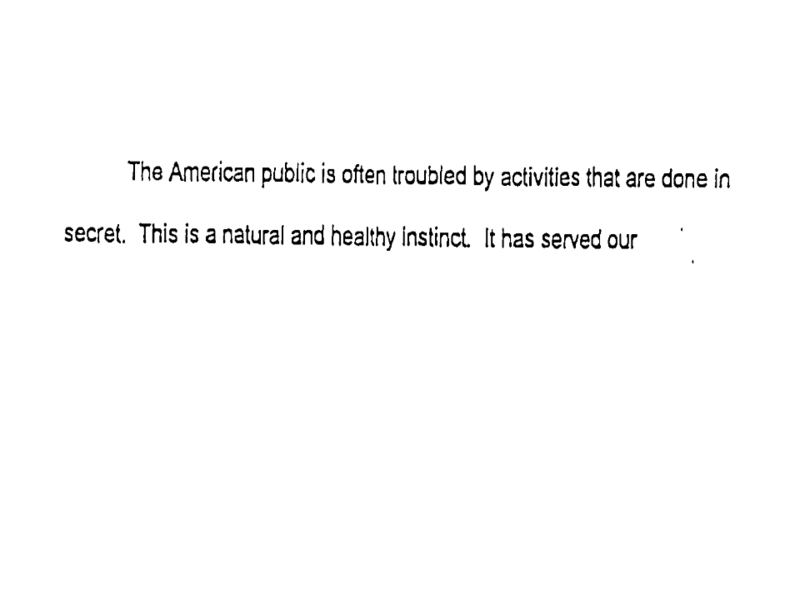 The American people will accept secret intelligence activity only if four conditions are met. First, the acts must be consistent with announced policy goals. Second, they must be carefully controlled under U.S. law. Third, the operations should be consistent with basic American values and beliefs. And fourth, when American intelligence services make mistakes – as we have and surely will do again – we learn from those mistakes. Because much of what the intelligence services do is secret, Congressional oversight is the key to providing the American people the confidence that their intelligence services are meeting these four conditions. Indeed Congressional oversight is the best way this confidence can be assured. The CIA’s guidelines assume that there is a tacit agreement in which Americans understand that there are certain things that cannot be made public, but that all effort will be made on behalf of the Agency to ensure that the secret practices are carried out in accordance with U.S. law and under intra-agency and legislative supervision. It may be the case that the CIA and the Department of Justice were right in their assessment of the harm caused by Ames’ duplicity and correctly charged him under the Espionage Act. However, charging Kiriakou and others for telling the media about practices such as waterboarding, which President Obama himself has called torture, is inconsistent with the CIA’s stated modus operandi. The CIA no doubt supports the charges being brought against the likes of Kiriakou as a means of hiding evidence that would implicate U.S. officials of war crimes and crimes against humanity, especially at a time when foreign prosecutors in Spain, Italy, and Germany are already pursuing “extraordinary rendition” cases. Sadly, the CIA and the Department of Justice’s unscrupulous behavior gives credence to Ames’ claim that “our espionage establishment differs hardly at all from many other federal bureaucracies, having transformed itself into a self-serving interest group, immeasurably aided by secrecy.” It also contradicts Deutch’s promise that the CIA strives to make its actions consistent with “American values and beliefs,” or that the Agency is learning from its mistakes – or if it even differentiates between when it makes mistakes, or simply gets caught doing something the American people would find troubling, like waterboarding. 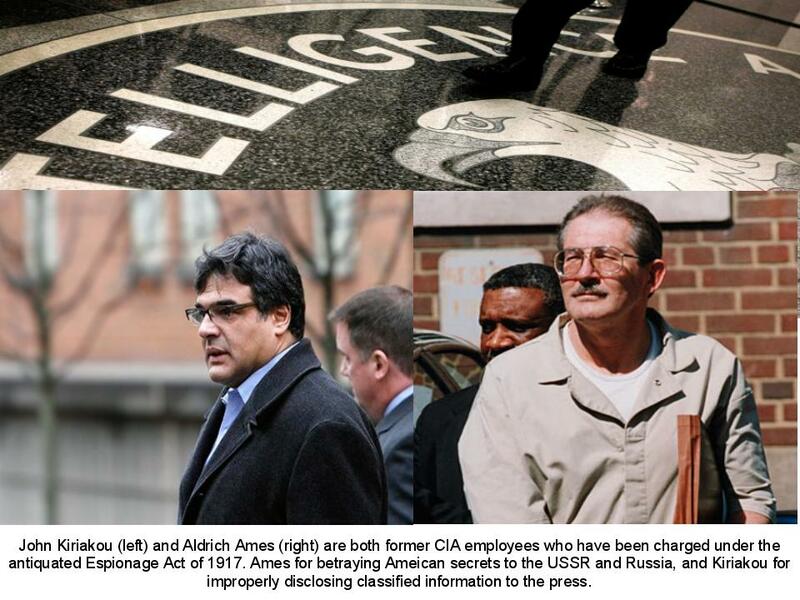 No wonder the CIA wants people like John Kiriakou in prison –whether they have committed “espionage” or not. It seems his agenda was quite different than that of Ames, and I don’t think you should lump the two together so freely.